NASHVILLE, TN - Mar. 30, 2017 - With a new sense of history and possibilities, Lady Antebellum reveals the cover art and track listing behind their sixth studio album HEART BREAK (Capitol Records Nashville), out June 9th. Dave Haywood, Charles Kelley and Hillary Scott had a new mission — setting aside time to put themselves in new surroundings, and concentrate on writing and exploring musical endeavors with no distractions. They rented a house in Florida, living and working under the same roof, and when the creative process proved successful, the trio set up a second retreat in southern California. Fans can now pre-order the ACM-nominated trio’s upcoming release at www.ladyantebellum.com. Encino, CA (March 29, 2017) – The Academy of Country Music® announced today additional performers, presenters and an unprecedented number of duos and special collaborations for the 52ND ACADEMY OF COUNTRY MUSIC AWARDS™, Country Music’s Party of the Year®. The special will be broadcast LIVE from T-Mobile Arena in Las Vegas Sunday, April 2 (live 8:00-11:00 PM, ET/delayed PT) on the CBS Television Network. Nashville, TN - March 29, 2017 – ACM Awards Vocal Group of the Year Nominee Rascal Flatts revealed the official track list for their highly-anticipated tenth studio album BACK TO US (Big Machine Records) today. The collection is reminiscent of the trio’s distinct sound that catapulted their status as international superstars, while maintaining an edge that has kept them at the forefront of the genre. Rascal Flatts will release a 10-track standard album to all retailers, while a 13-track Deluxe album is available now for pre-order exclusively on Amazon. Nashville, TN – Universal Music Group (UMG), the world leader in music-based entertainment, today announced a new worldwide recording agreement with seven-time GRAMMY® Award winner and two-time ACM Entertainer of the Year, Carrie Underwood. Underwood’s label home will be Capitol Records Nashville, one of four labels that form Universal Music Group Nashville and Billboard country label of the year for eight consecutive years. Nashville, Tenn. – Country’s breakout singer/songwriter Luke Combs is set to release his debut album This One’s For You on June 2 with River House Artists/Columbia Nashville, as he revealed today exclusively with Entertainment Weekly. Forecasted as “one of the most anticipated albums of 2017” by Rolling Stone Country, This One’s For You includes Combs’ debut hit single “Hurricane” which boasts a staggering 59 million streams and continues an unprecedented rise at country radio; reaching No. 1 on SiriusXM’s The Highway in December and this week, landing at No. 13 on both Billboard Country Airplay and Country Aircheck’s Mediabase Chart. This One’s For You will be available for pre-order at digital retailers and LukeCombs.com starting April 28. The 27-year-old Asheville, NC native co-penned all 12 tracks on the project which birthed from the rise of his music and songwriting in the mountains of North Carolina. In addition to “Hurricane”, This One’s For You includes hallmark fan favorite “One Number Away”, jocular, silver-lining song “When It Rains It Pours” and the poignant part-love letter, part-apology title track dedicated to those who supported Luke on the road to here. In addition to his trademark, rowdy headlining shows, Combs has shared the stage with Blackberry Smoke, Randy Houser and joins Brantley Gilbert on his 8-month cross country Devil Don’t Sleep Tour through September 2017. Combs has also been tapped to join star-packed festival lineups for Bonnaroo Music & Arts Festival, CMA Music Fest, Stagecoach Festival and Tortuga Music Festival this summer. Entering 2017, Combs was selected by iHeart Media’s Bobby Bones for his “Class Of 2017” and featured in Billboard’s 2017 Predictions Issue as one of four all-genre artists anticipated to breakthrough this year and topped “Watch Lists” curated by Huffington Post (Top 10 Country Artists To Watch In 2017), Pandora (Artists To Watch in 2017) and Rolling Stone (2017 Country Music Preview: Most Anticipated Albums, Tours, Festivals). Nashville, TN, - (March 25, 2017) - Seven-time GRAMMY® Award winner and ACM Entertainer of the Year nominee Carrie Underwood celebrated her 100th performance on the Grand Ole Opry this weekend with four sold-out shows. Underwood made her Opry debut on June 10, 2005, less than two weeks after winning American Idol, and became an official Opry member in 2008. Her love for the Opry started as a child, as she grew up watching and listening to the show, dreaming of one day performing there and even becoming a member herself. 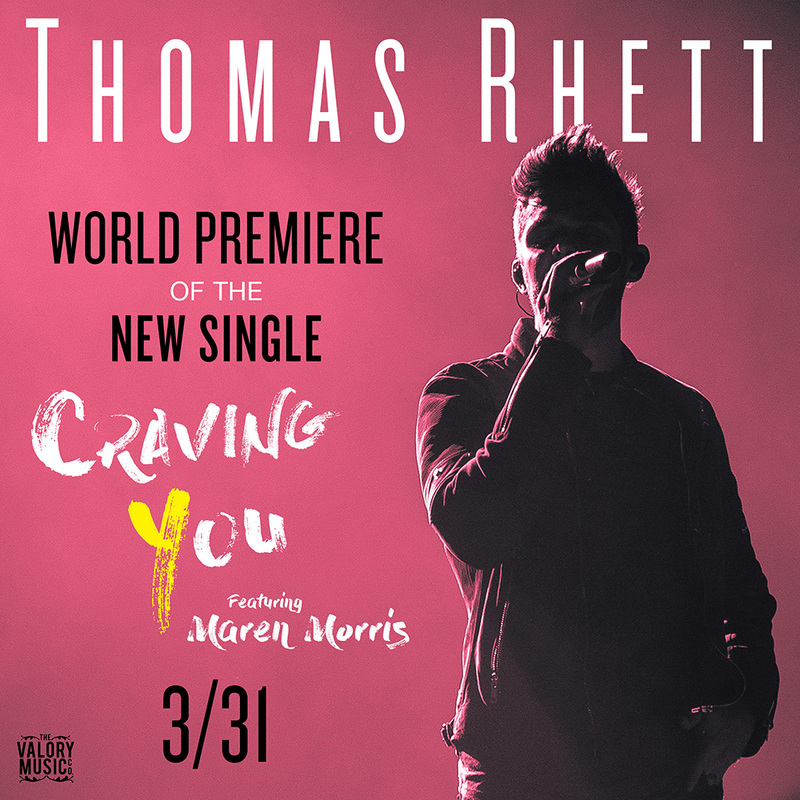 WHO/WHAT: Multi-PLATINUM artist THOMAS RHETT unveils the single cover for “Craving You” featuring GRAMMY® award winner MAREN MORRIS today (3/24), teasing it as the lead track from his upcoming third studio album. WHEN: “Craving You” featuring Maren Morris makes its world premiere on Friday (3/31). ABOUT THOMAS RHETT: As "2017 is already shaping up to be a banner year" (Entertainment Tonight) for Thomas Rhett, the new music follows his PLATINUM-certified sophomore album TANGLED UP DELUXE (The Valory Music Co.), which includes his recent seventh career No. 1 and the fastest-rising single of his career “Star Of The Show,” along with the 3X PLATINUM, six-week chart-topping smash “Die A Happy Man.” As he has "catapulted to superstar status" (The Daily Chronicle), Thomas Rhett has garnered major trophies from the Country Music Association, Academy of Country Music, Billboard Music Awards, iHeart Radio Music Awards and CMT Music Awards. While surprising fans with a taste of new music throughout sold-out stops on his 2017 HOME TEAM TOUR, he continues to usher in capacity crowds with “one of the best Country concerts of the year" (Peoria Journal Star). For more information about new music and for a full list of upcoming tour dates, visit ThomasRhett.com. Nashville, TN – Grammy award-winning superstars Tim McGraw and Faith Hill announced today the release of their newest collaboration, “Speak to a Girl,” to impact country radio at 4 pm Central Time Thursday, March 23. Subsequently, the new single on Arista Nashville, will be available to download and stream. Nashville, TN - March 17, 2017 - In a press conference today at South by Southwest (SXSW) in Austin, TX, Garth Brooks announced that “Ask Me How I Know,” (Pearl Records, Inc.) written by Mitch Rossell, will be the second single from his “strong new album” (New York Times) GUNSLINGER. The song, available to preview here, is a poignantly reflective track heralded as a “romantic power ballad” by LA Times. It was also revealed that Brooks will headline Saturday night at the SXSW Outdoor Stage featuring Garth Brooks: Presented by Amazon Music. Taking place at at Ladybird Lake, complimentary general admission tickets can be obtained here starting at 12:00pm today (3/17.) Tickets to this event are restricted to residents of Austin and surrounding areas. SXSW registrants and Music Festival wristband holders can also attend, with a special allocation of space made available via Primary and Secondary access. To view the full press conference click here. Encino, CA (March 14, 2017) – The Academy of Country Music® revealed today the winners for the new artist categories for the 52ND ACADEMY OF COUNTRY MUSIC AWARDS™. Brothers Osborne, Maren Morris and Jon Pardi have been named New Vocal Duo or Group of the Year presented by T-Mobile, New Female Vocalist of the Year presented by T-Mobile and New Male Vocalist of the Year presented by T-Mobile, respectively. Each of the winners in the new artist categories will perform on the 52ND ACADEMY OF COUNTRY MUSIC AWARDS, co-hosted by Luke Bryan and Dierks Bentley, to be broadcast LIVE from T-Mobile Arena in Las Vegas Sunday, April 2 (live 8:00-11:00 PM, ET/delayed PT) on the CBS Television Network. LAS VEGAS, Nev. – With a North American record-setting final tour stop sell-out at AT&T Stadium on his The Cowboy Rides Away Tour, 104,793 fans helped multiple ACM and CMA Entertainer of the Year George Strait bring one chapter of his inimitable touring career to a close, but the book is far from over for the iconic artist who continues to rank among country music's most-streamed artists, logging more than four billion audio streams and counting as of this week. Nashville, TN – Country superstar Brad Paisley announced today the track listing of his forthcoming Arista Nashville album, LOVE AND WAR, which streets April 21. Fans can download the first single and Top 5 hit “Today” HERE and stream it HERE. NASHVILLE, TN - Mar. 2, 2017 - ACM Awards “Male Vocalist of the Year” nominee Thomas Rhett brought together close family and friends yesterday (3/1) at Nashville's vintage arcade bar Kung Fu Saloon, to celebrate his chart-toppers "T–Shirt" and "Star Of The Show” off his sophomore album TANGLED UP DELUXE (The Valory Music Co.). Nashville, TN - March 3, 2017 – ACM Awards “Vocal Group Of The Year” nominee Rascal Flatts unveiled BACK TO US as their tenth studio album when they stopped by The Ellen Degeneres Show today to perform their “sure-fire smash” (USA Today) “Yours If You Want It." BACK TO US, available May 19 on Big Machine Records, follows the multi-platinum selling group’s overwhelming successes to date, with a collection of tracks that showcases what the group is best known for, encompassing their distinct harmonies and instant anthems. Fans can preorder the new album now here. “There was a nostalgic feeling between the three of us while in the studio for this record, a feeling that was more reminiscent of our first albums,” said Jay DeMarcus. “The journey we’ve all been on together is unreal and I can honestly say I’m even more excited about what is ahead for us. ‘Back To Us’ is not only a title of a song on the album, but a feeling that has been building around this new music. It just fits in so many ways." NASHVILLE, TN (March 6, 2017) –Grammy Award-winning vocal group Little Big Town’s new album, The Breaker, debuted No. 1 today on the Billboard Top Country Albums chart and No. 4 on the Billboard 200, marking the group’s fourth Top 10 project on the Billboard 200 chart.